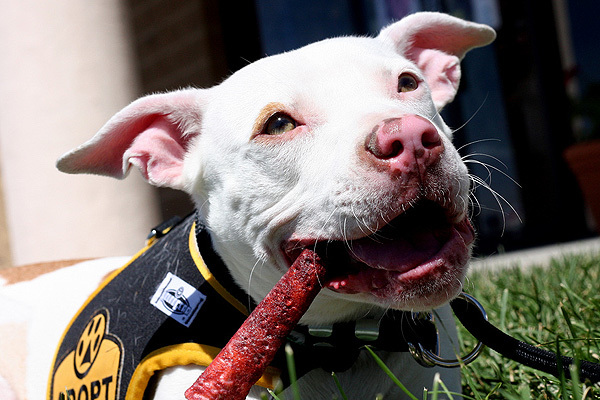 Whether it’s education, special bully classes, spay and neuter deals or simply treating pit bulls just like any other dog, we salute these shelters for doing all they can to get pit bull type dogs into loving, forever homes. 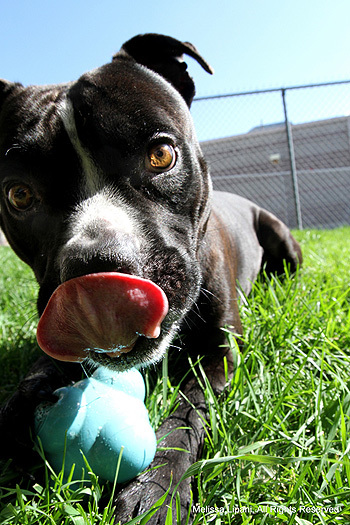 ‎Salt Lake County Animal Services in Salt Lake City, Utah has a program devoted to Pit Bulls called The Salt Lake County Pit Crew (SLCo Pit Crew). The folks working in this program are rock stars. They make sure to educate the general public about bully breeds through media spots and community outreach events, highlighting available ‘adopt-a-bulls’ and raising positive awareness about these lovable breeds. 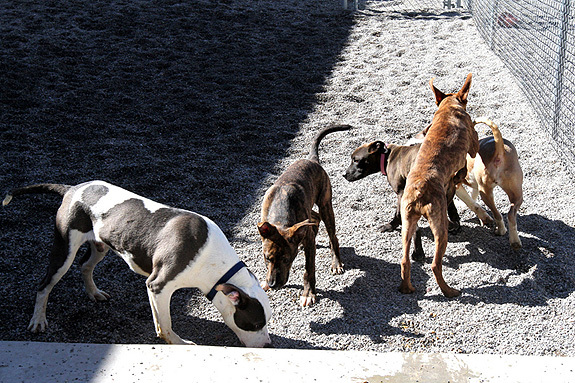 They also go above and beyond to make sure that the bully breeds in the shelter (all dogs, actually) get out for playtime with others in the yard, ensuring that they have adequate behavior assessments on each dog, while also giving them much needed socialization time – which only helps them present better in the kennel. I’m a foster with the Pit Crew and it’s been a pleasure to fall in love with and find homes for over a dozen ‘pibbles’ to date! Props to Kiera Kincaid Packer and the SLCo Pit Crew!! Squishy-face blockheads worldwide should be howling your praises! Our community shelter is no-kill (Rockwall, TX in the DFW-area) and pits are treated like any other dog that is taken in. The Edmonton Humane Society offers pit bull/ bully breed specific classes. The shelters we adopted our pit bulls from (Pennsylvania SPCA and Philadelphia Animal Control) both had the BEST kind of program out there……NOTHING! They market pit bull dogs as individuals, nothing more and nothing less than any other dog. No special applications, no extra screening for adopters, no separate temperament tests or behavior evaluations, etc. Both of my dogs came from the St. Pete pound, but across the bay, Tampa’s animal control goes above and beyond to adopt out as many pit bulls as possible since 2007. Yes! They call it the SLCo Pit Crew and it is an amazing program. The shelter employees and volunteers work with and get to know each of the dogs as individuals. The dogs have names, they have photo shoots with costumes for the adoptables, and they do everything possible to show off to our community what amazing dogs they are. They organize and host regular community outreach events like Neighborhood Pit Bull Day where pitties and their owners can get out, socialize, get vaccinated and fixed, and even things like a leash and collar exchange. They offer training and support to adopters, and perhaps the most stand-out thing is the love they have for each dog, being genuinely interested in how alumni are doing, even as the years pass. The knowing and loving of each individual dog is especially important to me because I am certain that without it, two of my three furkids would not be mine, or maybe even adopted at all. The kind of dedication shown by the Pit Crew staff and volunteers saves lives, and we are forever grateful. Dane County Humane Society has two classes dedicated to pit bulls: Pitties 1 and Pitties 2 to teach obedience and to educate the families to be the best pittie owner and ambassador. 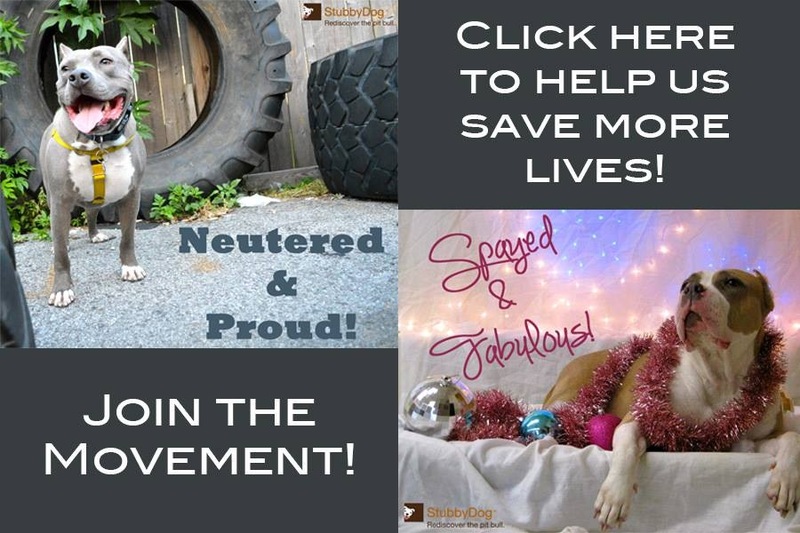 Also they have a monthly newsletter for pittie owners and are very active in the community for finding foster homes and community outreach for the breed. Here in St. Louis County we evaluate and adopt as individuals. We are working on a spotlight and training program for pit bulls to encourage higher adoptions. Here in Albany, NY, the Mohawk Hudson Humane Society started its Save-a-Bull program just last year! Obviously the shelter takes in a large amount of pit bull and pit bull type dogs, so the program is a low cost spay/neuter, community education, free training classes for pits & pit mixes and an advocacy program! The goal is to educate the people of the community as well as the pitties of the community so more stay in good homes and less end up on the streets or in the wrong hands! In July they won a $25,000 Pepsi Refresh Grant to get the ball rolling and boy is it rolling! We have a local pit rescue that is solely run through various foster homes and they are wonderful. The animal shelter I volunteer with, CHA Animal Shelter, has a Luv-a-Bulls program that they had to go through quite a bit to create. They were among the first in this area to create a pit bull program that saves them, rather than put them down like many of the others in our area. CHA has had many pit bulls come through the program that have been able to successfully find loving homes because of it. CHA does a great job of doing a special screening process for pit adopters to make sure the pit will be loved and cared for. My brother adopted his from there and she is one of the most amazing dogs I’ve ever met. CHA is consistently doing things to promote the dogs and explain the truth about the breed. They have posters on all the kennel runs belonging to one of the current adoptable pits with a pit bull myth vs. fact that potential adopters can read as they view all of our adoptable animals. They have also held a couple BSL and pit education classes for the community to learn the truth about pit bulls. Palouse Pit Bull Project is a satellite program under the Humane Society of the Palouse a no-kill, 501(c)3 non-profit animal shelter located in Moscow Idaho. The three part program (microchip, fix and train) is designed to educate and assist pit bull owners in Latah & Nez Perce Counties in Idaho and Whitman & Asotin Counties in Washington. The mission of Palouse Pit Bull Project is to increase positive awareness of the pit bull breed, educate the community and dog owners on true breed characteristics; provide resources to prevent unplanned litters, offer owner education and dog training to assist in long term dog/owner relationships. I volunteer at the Seattle Humane Society and they do an awesome job for our pit bulls! Last year they did an entire month promo for the pit bulls naming them after flowers – really showing how sweet and wonderful they are! And SHS offers free spay/neuter to pit bulls in King County and $5 for microchip! And promoting responsible dog ownership (any dog), and training class is included in the adoption fee! (I got both my babies there) They do a great job! The folks at the SLCo Pit Crew are fantastic! Combined with the efforts of everyone involved in the valley, I really feel like pit bulls have a better chance here than they used to. They have a very strong public presence because of the different events they put on (from huge adoption weekends to public outreach). If it weren’t for the Pit Crew, I can honestly say that we wouldn’t have adopted one. I didn’t have a stigma but I had NO IDEA how wonderful these dogs are and how mistreated and neglected they are by our society. Many, many thanks to the Pit Crew, Salt Lake County Animal Services, and everyone else that helps them out! People who think we don’t need any special programs for pit bulls and bull adopter education have never had to be the one to euthanize a swell, adoptable pit bull just because there were too swell, adoptable many pit bulls in the shelter already that no one wanted to adopt. MOST people don’t come into shelters looking for a pit bull. 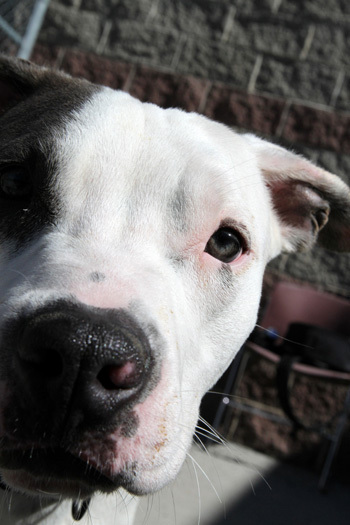 Most of the pit bulls in shelters have been neglected up to that point in their lives. Most adoptable pit bulls in shelters, not well socialized but probably still friendly if they made it that far, don’t have the manners they need to get adopted. They don’t have the training they need to be successful in the home of anyone other than someone who already knows pit bulls well. 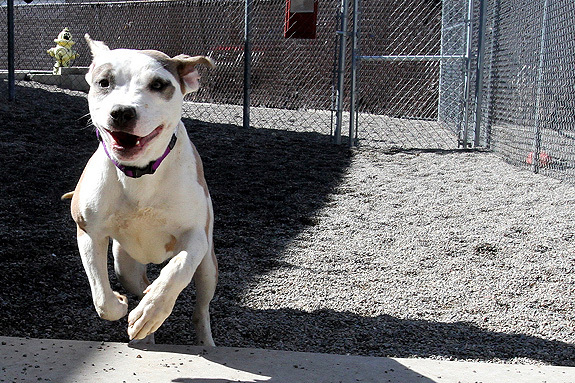 Most adopters don’t know pit bulls well. That’s why education and special pit bull programs are our jobs. If you say your city or shelter doesn’t need special pit bull programs, you should go ask the staff at your local animal control that euthanizes healthy pit bulls because they are always over-saturated with them. And, by the way, yes, your no-kill shelter does euthanize dogs. By definition, they euthanize unadoptable dogs, just like all other shelters. They do not euthanize adoptable dogs, but a couple weeks, or sometimes nights, in a kennel is all it takes to make a sweet, adoptable pit bull into a confused, kennel-nuts unadoptable pit bull. And, let’s review what we just learned: All animal shelters, even no-kills, euthanize. So a pit bull that is adoptable on day 2 is kennel crazy by day 6 and is euthanized. Without special programs to manage a pit bull’s special energy needs, since they wait, on average, 25 times longer to be adopted than any other specific type of dog, most pit bulls who come in as adoptable will be unadoptable before they have an opportunity to find that rare, qualified pit bull adopter. This happens hundreds of times every day in this country. So, yes, special pit bull programs save lives. Treating pit bulls like every other dog serves to disenfranchise owners and does the dogs no favors. The only way to stop the euthanasia of adoptable pit bulls is to be unrelenting in our education of the public and sterilize as many as we can. Really? You sure sound like you know it all, but you actually are uneducated on the topic. My local municipal shelter is 100% No-Kill and it is 99% pit bulls. All pits are adopted out, no matter how little or long time it takes, and sometime it takes years. While they are there, they get walked everyday by volunteers, have outside yards to play in, etc. The shelter has never killed one dog, NOT ONE!!! Even a dog with cancer was treated with chemo, radiation and allowed to live out what remaining time she had in a foster home. They treat pits just like any other dog and almost everyone who comes in, is looking for a pit. You think it is hard to find that “rare, qualified pit bull adopter”? There are loads of amazing people who would have no other breed and that is why pit bull rescues adopt out as many pit bulls as they do. In the city (wealthy community 25 miles north of NYC) where I live, pit bulls are one of the most popular breeds, and our politicians have them as well. Your comment that “a couple weeks, or sometimes nights, in a kennel is all it takes to make a sweet, adoptable pit bull into a confused, kennel-nuts unadoptable pit bull” is a lie. I invite you to come to my municipal shelter and I will set up a meeting with the head ACO for you who will educate you on the fact that she never kills a single dogs. She keeps all until they find homes, whether it is 1 week or 4 years. None of her dogs have ever become “confused, kennel-nuts unadoptable pit bull” and she will show you how totally adoptable every single one of her pit bulls is. I sincerely hope that you are not involved with pit bulls in any way, because your attitude is wrong and damaging. Have you ever met a truly aggressive, untouchable pit bull? I’m not talking fighting dogs. Fighting dogs are so often easy to handle because they’ve been, unfortunately, working closely with a human for some time by the time we find them. I’m talking about the worst kinds of victims. The un-rehabable ones. The dogs who’ve truly never met anyone other than the one person who neglected them, maybe occasionally interacting with them, but probably in a violent fashion. Those dogs, the ones most people never see, the saddest of all the sad stories any ACO will ever have for you. I keep some of those stories so private, because of how overwhelming it is to have been the one to hold a dog for its euthanasia who has only ever met a half dozen people, if you count the two people in the room for the procedure. I’m talking about the ones that only the ACOs and poor soul assigned to euthanasia, and maybe a shelter manager, ever see. Even those amazingly well-managed, well-funded and community-supported sheltering systems (and bless them for the hard work they do to use preventative programs, probably even some pit bull-specific programs) will, maybe albeit occasionally, those truly terrifyingly unadoptable dogs. I have worked in communities rich with poor residents who produce lots of those dogs. I have also worked in affluent communities where there were fewer of those dogs, but even in the snazziest, best-run, best-staffed, best-supported organizations, unadoptable dogs happen. Please appreciate that you live in a place where it sounds like your animal control is progressive and does an amazing job with modern programs and enormous efforts. I bet they organize an army of volunteer and donated help too, and offer low- and no-cost spay/neuter services as well. But also appreciate that that is a rare exception. And at no fault of the kind people who work in these facilities, most pit bulls in the US are euthanized. For behavior. Whether demonstrated or assumed because of the shape of their big, beautiful heads and sturdy bodies. Whether it’s the stupid law where you live or not, pit bulls die every day. And the best way to prevent the suffering of these amazing, intelligent, sensitive animals is to educate the public and sterilize as many of them as we can. Thanks for this more realistic reexamination of some pit bull shelter policies. (I adopted my rescue AmStaff this past summer.) Previous animal control policies in some regions (which boasted NEVER adopting rescued/stray pit bulls out, here in Norfolk for example), seem to have “flipped” to a no-policy policy. Given the proliferation of these dogs now (I blame irresponsible backyard breeders like neighbors of mine), I believe that care in training and socialization MUST be taken, to return the breed-type to its previous fame as “America’s Dog.” These can be great, GREAT family pets and working dogs, if given the opportunity. Rescues, Shelters and the Programs they have are great. What would be even greater is if even 5% of those efforts were put into preventative programs (ie aggressive anti BSL, anti fighting, anti tethering, anti backyard breeding, etc) so we didnt have every shelter and rescue in America over filled to the brim to begin with. One of the best things the shelter I volunteer at (Anti-Cruelty Society in Chicago) was to eliminate the seperate Bully Buddy program and intergrate all of the pitbulls into our main adoption room. We are an open shelter so we do not put down any adoptable dogs, but some of our pits were sitting in the shelter for months since they were only available to be seen by the public by appointment. Now that they are in the adoption room they are getting adopted out so much quicker as people who were not necessarly considering a pitbull get to see what goofy sweethearts they can be! Also any volunteer in our dog programs can take them out for playtime, giving the ones who do stay a bit longer so much needed stress-relief.